With the wide spread popularity and availability of internet and web services people have grown fonder of the online world. People are now spending more time over the internet than they do at anything else. It has become an essential part of our lives and it is believed that the coming generations won’t even be able to think of a world without internet. Such huge popularity has also attracted businesses that saw it as an opportunity and started expanding their business over the World Wide Web. Today, everybody wants an e-commerce solution as it is one of the best ways of earning over internet. E-commerce software application development has become one of the most demanded services by organizations as it enables them to establish their business in the online world. For all those who are planning of using e commerce application development services, we have selected and present to you the top 3 PHP frameworks that you can use for getting your solutions developed. 1. Magento: It is one of the most popular and widely used PHP frameworks for developing online stores and e- commerce solutions. Magento is built upon MVC architecture and provides an open source platform to developers where they can create great e-commerce solutions. Moreover, you can choose from a list of three versions made available by the company depending upon the size of your business and your specific needs. 2. osCommerce: For a complete solution for online ventures and e-commerce solutions, there is no one better than the osCommerce. oscommerce comes along with front end that is catalog based and an administrative back-end which provides great flexibility to users. This is a great e-commerce development platform as it allows businesses to present their products in the form of a catalog. 3. Zen Cart: Zen cart is for those who want to do things simply. 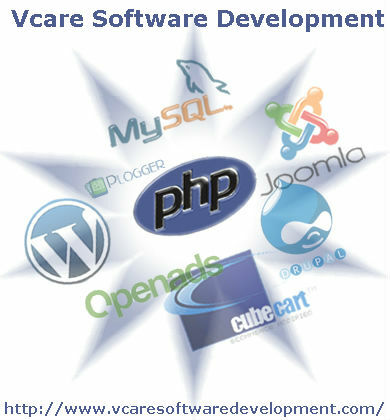 This PHP platform makes installation, customization and management as simple as it can be. For all those online merchants who crave for a simple, easy and yet an effective e-commerce solution, Zen Cart is the answer for them. The platform also provides various online and offline payment features that could simplify the payment experience for customers. Most of the vendors offering e-commerce software applications development in India use these three PHP platforms for developing e-commerce solutions for their clients. If you have any questions or want to share your view on this topic, then please leave us a comment below.